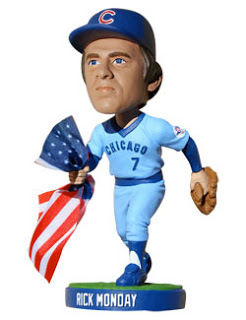 The LA Dodgers held Rick Monday ‘Flag Saving’ Bobblehead Night this past season to commemorate an awesome act of patriotism that took place on April 25, 1976. That was the day Chicago Cubs outfielder, and former Marine, Rick Monday saved an American flag from being burned by protesters in the outfield at Dodgers Stadium. It was a moment in time many Dodgers, Cubs, and diehard baseball fans probably remember but the casual fan and younger generations not so much. This is one of the great things about bobbleheads. They can be used to capture and celebrate a special moment. Bobbleheads are practically like 3-D photographs. People who capture memories in pictures can now immortalize them in bobblehead form. A fascinating story like Rick Monday’s was brought back to life almost 40 years later because of a bobblehead. Lucky fans who were able to snag a bobblehead will likely never forget Monday’s heroic tale as a result of the doll. You see a lot of bobbleheads, especially in sports, used in this capacity. If a team wins a championship, they create a bobblehead to honor it. If a player wins an award, they get their own bobblehead celebrating the accomplishment. What many fail to realize is bobbleheads aren’t just for athletes and superstars anymore. Custom bobbleheads give everyone an opportunity to commemorate the special events in their lives. 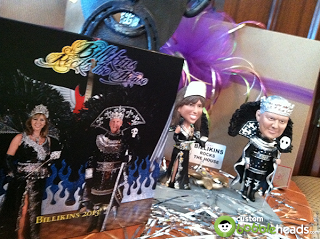 As "King and Queen" of Mardi Gras, this couple was given a pair of custom bobbleheads to celebrate the occasion. Basically, any extraordinary occurrence in your personal or professional life can be recreated and remembered with a bobblehead. Build your memory today!